Thanks to the bean bag in his tail, the 28 cm Soft Cuddly Friends Bearzy Teddy bear can sit beautifully next to his best friend. His eyes and nose are lovingly embroidered and the inside of his ears, arms and the paws are made of short haired plush for baby's soft skin. 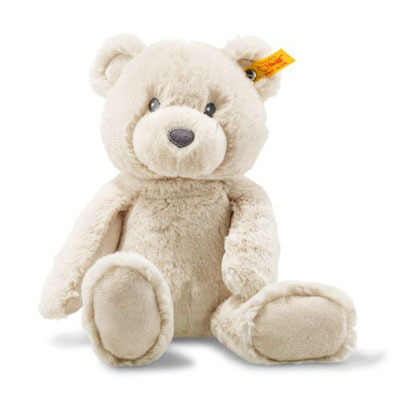 The fur is made of longer ultra soft plush and the arrangement of the different surfaces invites baby to feel and touch.